Governor Godwin Obaseki of Edo State says the state government, effective from January 1, 2017, will commence the contributory pensions scheme for state workers to mitigate the challenges being faced by pensioners. Gov. 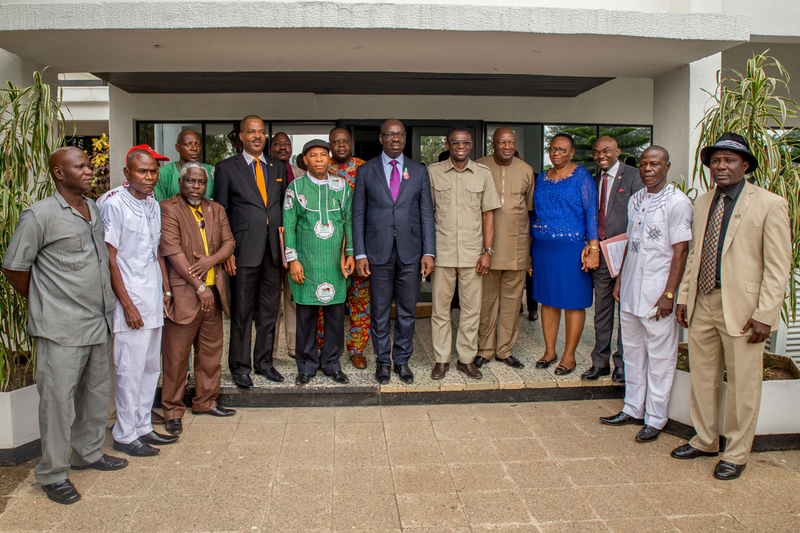 Obaseki made the disclosure during a courtesy visit by the leadership of the Nigerian Union of Teachers(NUT) on Tuesday in Government house. He assured the union leaders that by the end of his tenure, the State Government would have resolved all the teething problems about payment of pensions and gratuities of workers in the state. According to him, , “the issue of pension is one that we will deal with. So, in this year’s budget, what I have said is, effective January 1, all of us will now move into the contributory pension arrangement. So that by the grace of God, the next generation of teachers will not go through what you are going through now. That is, the pension money is already there. it’s automatic. You know the money that is to be converted to annuities and there are liabilities while the bulk sum is paid to them. “I was part of that arrangement when Obasanjo set up the pension committee to review the pension system. So, by the grace of God, effective January 1, we are cutting everybody over. And we have made a provision in the budget for that monthly contribution. I think the contribution monthly is 15%; 10% on behalf of government and 5% on behalf of you. Gov. Obaseki said government had already earmarked the sum of N6 billion for the pension scheme. “But for the legacy issues, for people who were not qualified to cut over, because this is not going to affect people who are five years and above in service. We also have provided money because this is a problem which has accumulated over a period of time. It is not a problem you can resolve over-night. But because of our commitment, we said, let’s put some money aside. And in this year’s budget, we are putting about N6 billion. “We will not solve all of it, but it’s a good start. If we are able to put this kind of amount every year for the next five years, we will clean out all arrears, both gratuities and pensions,’’ he said. The Governor also noted that human element was being given attention by his administration. “If you listened to my budget yesterday, I did emphasize that we want to pay more attention to the human element, the social issues in our society because in a recession like this, it’s the human beings that are mostly affected. So, we cannot ignore their plight. We want to build infrastructure, we want to do many things, but people must live first before they can use infrastructure. So, that is one area we are concerned about. And thanks to President Muhammadu Buhari, who is also concerned about this . Gov. Obaseki appreciated the massive support from teachers during the last election, saying “I am truly grateful to you and your members for the unprecedented support that all of you gave to me during the electioneering. “That I am Governor today, that was largely determined by you. So, if I succeed, it is your success. So, I am not surprised that you came to pledge your loyalty because you elected me to be your Governor. He assured the teachers that government would intervene in the flooding at the Teachers House, adding that “I understand firsthand the challenge of the flood at Teachers’ House. The governor pledged to sustain the policy which enables teachers to rise to grade level 17 in the state service and become permanent secretaries. Earlier, the state NUT acting Chairman, Comrade Iyalomhe Akhagbemhe congratulated the Governor on his election and inauguration as Governor of Edo State. He said “it is with great delight and fulfillment that we have come today to once again congratulate Your Excellency on your electoral victory at the September 2016 gubernatorial poll and your subsequent inauguration on the 12th of November, 2016 as the Executive Governor of Edo State. “We wish to formally thank you for the unprecedented support and contributions which you gave to our immediate past Comrade Governor – Comrade Adams Oshiomhole’s administration which enabled him to achieve monumental landmarks in the overall development of Edo State during his regime. The acting Chairman appealed to the Governor to ensure he appointed people with credible and impeccable pedigree who could key into is developmental drive to move Edo state to higher height. He called on Governor Obaseki to give the needed support and cooperation to the union as “it is the only registered and recognized union that caters for the interest, welfare and condition of primary and secondary school teachers. According to him, “the Nigeria Union of Teachers is the only registered and recognized trade union organization in Nigeria that caters for the interest, welfare and conditions of service of all primary and secondary school teachers as enshrined in all the enabling labour laws in this country. He expressed gratitude to the State Government for the regular payment of teachers’ salaries, saying the union is grateful to Edo State Government for the regular payment of teachers’ salaries despite the economic recession that has gripped many states of the federation. We urge you to continue in that direction,’’ he said. Akhagbemhe pledged the union’s loyalty to the administration of Governor Obaseki and wished him and his government great success.